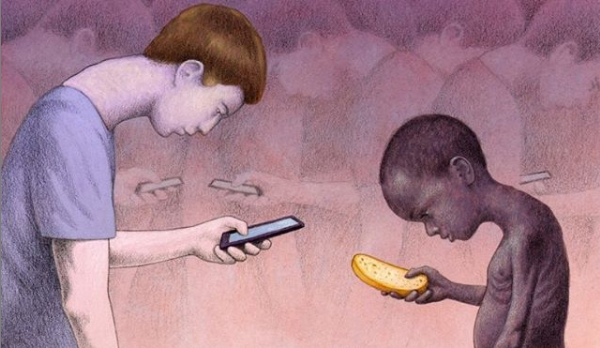 Gluttony for new technology is causing extinction of rare natural elements. Yet, there is a heavier price for our insatiable consumer paradise, if we buy a new cell phone device or a laptop, we are part of this destructive predator named Capitalism, the beast of 'First World Nations' that is driving ecocide. 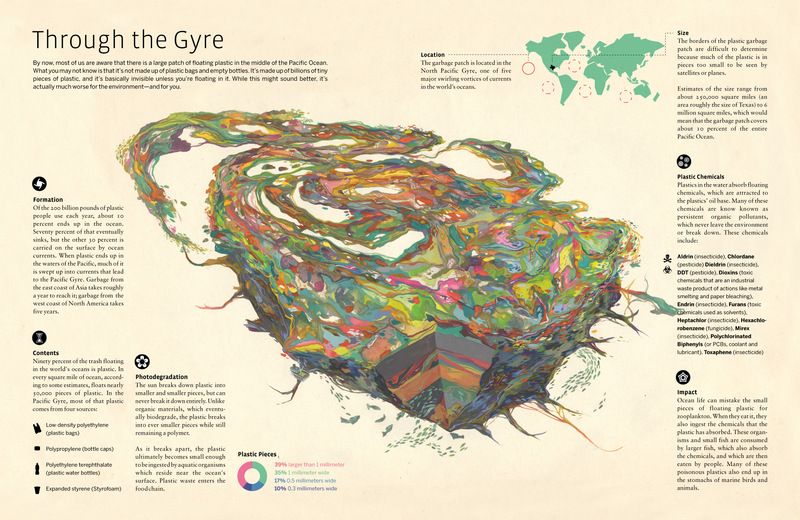 The predator that we feed, leaves behind a trail of destructive footprints across the planet, wherever it treads to extract and deplete, natural resources. The frightening thing is, no where on Earth is left sacred, protected or untouched any more, because Corporations are able to lobby, (legally bribe) politicians to rewrite environmental laws or any law that allows corporations to access minerals, oil, gas or any other biological resource, even in the most protected national parks, environmental laws have dwindled dramatically over the last forty years. All species, all ecosystems, all natural resources are dwindling at an exponential rate, as a result of this predatory insatiable appetite. Every day, we dispose of over 416,000 mobile devices and 142,000 computers usually disposing of them in landfills and incinerators, where as a tiny portion are recycled, stated in a recent EPA survey. A BBC Panorama program said that every year 20 to 50 million tons of e-waste is generated worldwide. Another EPA report reveals that by recycling one million cell phones, we can recover more than 20,000 lbs of copper, 20 lbs of palladium, 550 lbs of silver, and 50 lbs of gold. Then there are these other rare elements below that will soon be extinct, if we were able to recycle computers and cell phones without worrying about license laws, but with the care of the planetary resources in mind, we could millions of tons of reduce electronic waste each year and salvage rare elements that are becoming seriously depleted. Our over-reliance on renewing our technological devices, is driving this unfolding ecocide, the consumerism of electrical goods such as ipads, tablets and android phones. All of these electrical devices rely on a highly unethical mining industry that uses slave labour to mine and assemble electrical products in inhumane conditions; in addition to driving the destruction of the last cloud forests home of the highly endangered Silverback Gorilla populations in Africa. 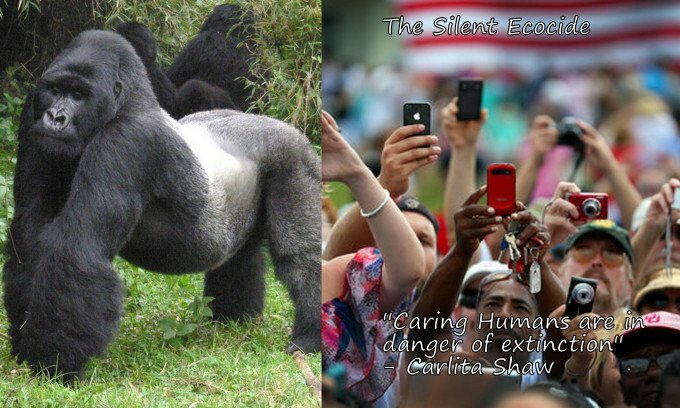 This is well illustrated by the story of the Silverback Gorillas in the African Congo. 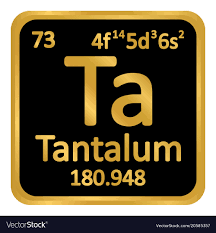 According the the European EuChemS new Periodic table on the rarest elements, Coltan Ta is under serious threat of disappearing within the next hundred years. Coltan Tantalite is used primarily for the production of tantalum capacitors, used in every kind of electronic devices such as mobile phones. Niobium and Coltan Tantalum have a wide range of uses, including refractive lenses for glasses, cameras, phones and printers. They are also used in semiconductor circuits, and capacitors for small electronic devices such as hearing aids, pacemakers, and mp3 players, as well as in computer hard drives, automobile electronics, and surface acoustic wave (SAW) filters for mobile phones. Coltan is also used to make high-temperature alloys for jet engines and other engine turbines. Coltan can only be found in a few places in the world, one of which is in Australia, which was the world’s largest producer at Wodinga Tantalum mine in Western Australia, however they closed their mine in 2012 because it is cheaper to mine Coltan using child and adult slave labour in inhumane conditions in Africa’s Democratic Republic of Congo and exposing these working communities to toxic chemicals. To make matters worse for the Silverback Gorillas, the SOCO International energy company are pushing to extract gas and oil reserves from under Lake Edward in the National Park. All this, at the cost of one of the last greatest African forests and majestic Gorillas which have only been given an estimated 15 years of survival amidst the adversities they face through our lack of global responsibility to better manage conservation of critically endangered species, because minerals, gold, diamonds and oil are far more important to the world than saving the Silverback Gorillas and their forest home. shows that international environmental and human rights laws are far too flimsy and ineffective. However, the Western world conveniently lacks humanitarian and environmental ethics in business, which in turn perpetuates slavery, species extinction and ecocide. 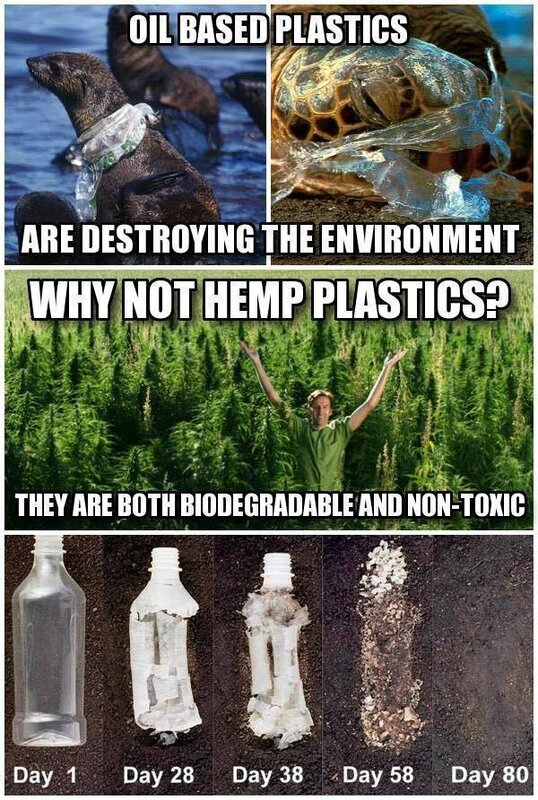 This has come so far as corporations suing and imprisoning entrepreneurs and innovators whose mere crime is to combat human waste and planned obsolescence to attempt to create sustainable solutions. 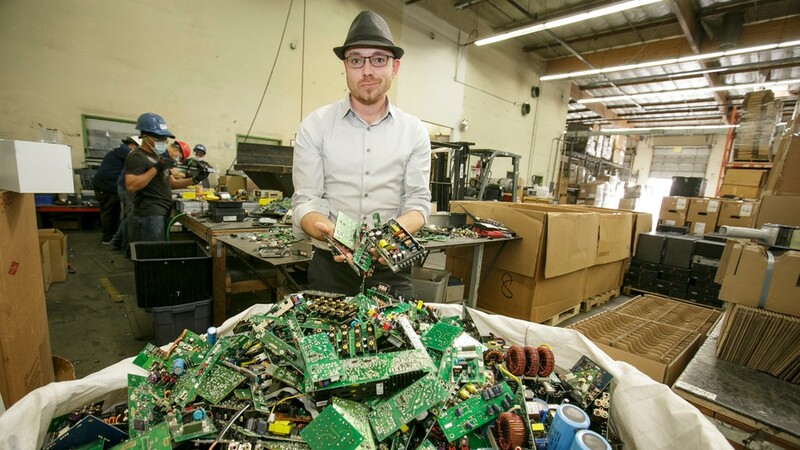 Eric Lundgren, a 33 year old e-waste entrepreneur, from Los Angeles, United States, was imprisoned in 2018 for his success in a business which achieved recycling of 41 million pounds of e-waste each year from major corporations such as IBM and Sprint. Microsoft took Eric Lundgren to court where he was then served a sentence of 15 months in prison and had to pay a $50,000 fine on April the 11th 2018. Microsoft's argument was that Lundgren could potentially damage their future sales of new computers and new software licenses, the court ruled in favour of Microsoft saying that he had infringed on Microsoft Corp. to the sum of $700,000. Lundgren pleaded guilty, but he stated that the value of his discs to Microsoft was zero, as Microsoft, nor any computer manufacturers, sell them. He also explained that the discs could only be used to restore the software to computers already licensed for it. The licenses are good for the life of the computer. Right-to-repair activists want legislation to remove the manufacturing and legal barriers that make it harder for consumers to fix their stuff. When people buy used devices and keep those devices working longer, fewer natural resources are needed for manufacturing and less e-waste ends up in landfills. Planned Obsolescence needs to be revealed for what it is. 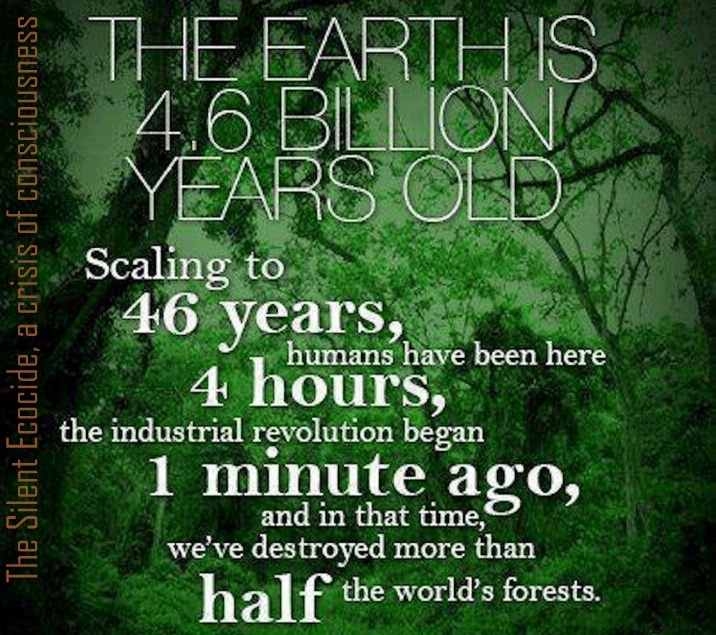 People need to wake up to the damage corporations and consumers are causing to the environment and the perpetuation of slave labour, habitat destruction for mining and as a result species extinction. Fifty million indigenous people live in the world’s remaining forests and 370 million Indigenous people live in various different threatened wildernesses and ecological biomes across the world. We need to take into consideration their defence treaties for the last natural wildernesses that they occupy on the Earth. I have found that working on conservation of the land with indigenous people involves dealing with many of the front line issues that the larger established charities, governments and academic institutes know little about. One common example in the Amazonia regions of South America, is the ongoing internalized governmental corruption where some government connected corporations provide finances and arms to vigilantes to attack indigenous environmental activist leaders and drive indigenous people forcefully off of their land. If governments in Amazon region countries gave more protection and powers to indigenous leaders and reinforced heavy prosecution on such cases, these incidents would be discouraged but instead they are conveniently overlooked and such activities are increasing with corporate land grabs and violations of indigenous people's rights to critical escalation in Ecuador, Brazil, Peru and Colombia. 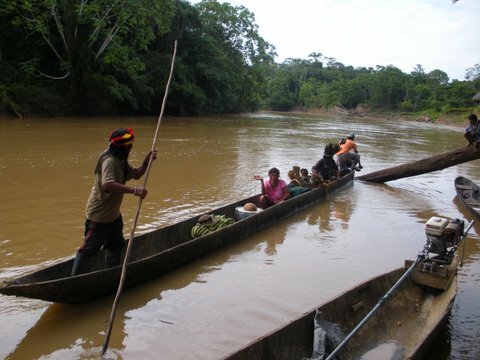 Many indigenous communities live solely off of the land, many live in isolated regions that are difficult to access, therefore most are not money motivated or materialistic in the way Westerners are and this goes in their favour to be the world's best and most trusted conservationists. Their lives depend on the preservation and conservation of their ancestral land, not on money. Their connection with the environment is not just dependent on daily living, it is part of their spiritual ancestry, their spiritual ecology, part of their souls and beating hearts. This is what we have forgotten in Western civilization. There are indigenous conservation treaty recommendations supported by many Indian and Alaskan Native organisations. A recent convention set up by the Indigenous peoples of all the Americas allowed them to form sixteen principles for building a sustainable and harmonious world community. This emerged from a 40-year-long process of reflection, consultation and action within Indigenous communities across the Americas. These principles are rooted in the concerns of hundreds of Indigenous Elders, Spiritual Leaders and Community Members, they are also rooted in deep ecology values, they recognise the interconnectedness of all life on Earth and how we affect one another and the Earth with our actions. They recognise how humans must work on internal balance to create external balance and a sustainable world. They recognise the importance of morals, and ethics in communities. These guiding principles constitute the foundation for the process of healing and developing ourselves (mentally, emotionally, physically, and spiritually), our human relationships (personal, social, political, economic, and cultural) and our relationship with Mother Earth. The senseless annihilation of the Earth’s last rainforests is part of an ecosystem, not only providing vital equilibrium for the climate but also plant medicines and foods and resources everyone takes for granted. Corporate ecocide has to stop along with the global unfolding ecocide of other ancient wildernesses where our great indigenous people remain. Here is a video of some of our experiences when we were there. All this senseless destruction of the Amazon rainforest, is for gold, or minerals and a non-renewable fuel, Petroleum, the black life blood of Pacha Mama herself, valued over human life and all life on planet Earth. 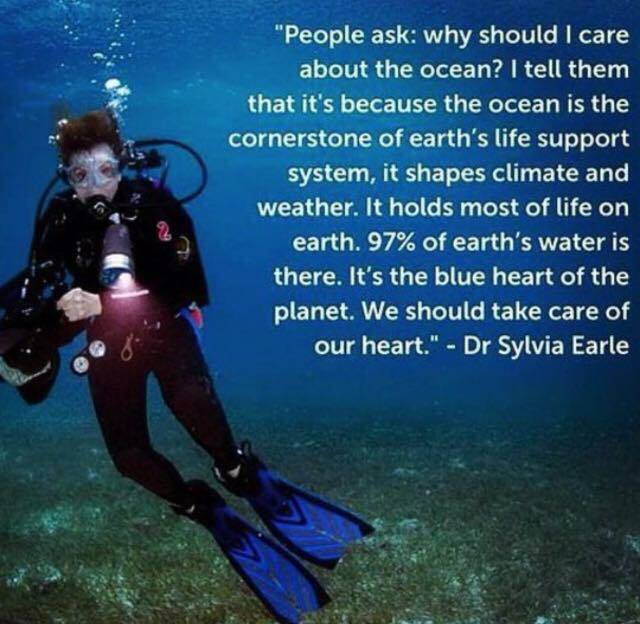 How many of us have to suffer and to what limit of destruction will this planet be pushed to, before we realise human consciousness is now an ecological issue? Humanity is a threat to itself unless we change the way we live on this planet, we have to live with nature, not separate from her, we are our environment, we are nature. Read these Sixteen Guiding Principles from The Four World's National Institute they offer these Guiding Principles as a gift to all who seek to build a sustainable and harmonious Global community. 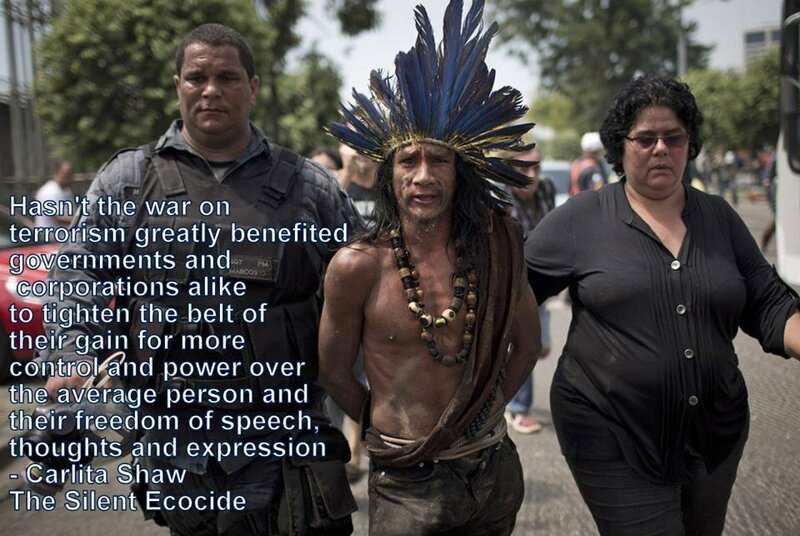 The Brazilian President Jair Bolsonaro, Openly declared Genocide on the Kawahivas people who are on the edge of extinction. The UN defines genocide as "any of the acts perpetrated with the intention of destroying, in whole or in part, a national, ethnic, racial or religious group." But the classification of such crimes as genocide or not is partly a matter of the number of victims. While the genocides of Rwanda or Bosnia received global attention, many others that take place outside the visual field of public opinion, especially on the Latin American continent. These are neither investigated nor recognized because they involve rural villages of a few hundred, or even a few dozen people. Although the agreement on the genocide of the United Nations (UN) Organization came into force 70 years ago, entire tribes continue to be attacked and exterminated by powerful corporations and their dominant society in order to steal their lands and natural resources. In the depths of the Amazon rainforest, one of these native tribes forced to uproot and leave their ancestral land because of this. It is the Kawahivas, a small isolated tribe of a few dozen members, survivors of waves of violent attacks that have brought them to the brink of extinction. ''Their territory, known as Rio Pardo, is in Mato Grosso state, where illegal deforestation rates are the highest on record in Brazil’s Amazon. Rio Pardo lies within the municipality of Colniza, one of the most violent areas in Brazil. 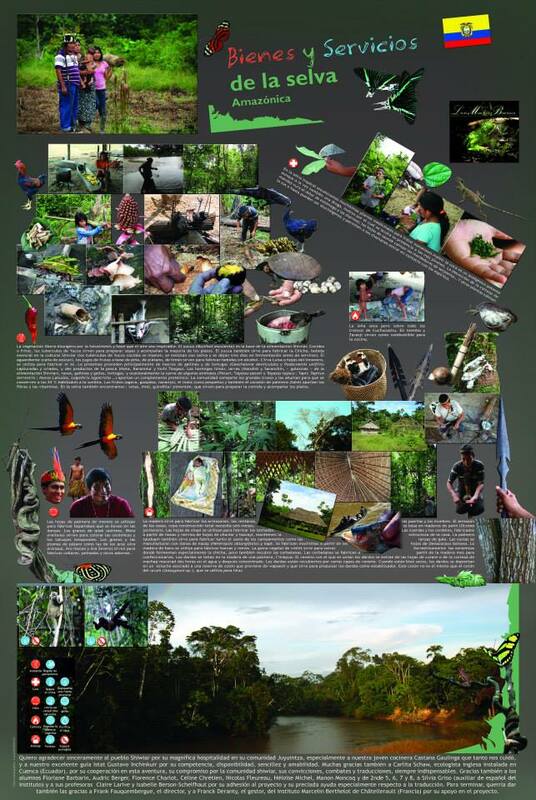 90% of Colniza’s income is from illegal logging. The Kawahiva’s plight is so serious that in 2005 a public prosecutor launched Brazil’s first ever investigation into the genocide of an uncontacted Indian tribe. Twenty-nine people suspected of involvement in killing Kawahiva, including a former state governor and a senior policeman, were detained but later released. The case has stalled for lack of evidence. ''- Survival International. We know almost nothing of the Kawahiva, except that they have been forced to change their way of life from settled villages to becoming nomadic and only setting up temporary shelters to constantly flee the Oil merchants and the Loggers tractors and mechanical saws. They live in constant fear of genocide, in this region of the Brazilian Amazon basin, where there is the highest rate of illegal deforestation in the country. The territory of the Kawahivas is located near the city of Colniza, one of the most violent areas of Brazil, where 90% of the income comes from illegal logging for the timber industry. Unless the Brazilian authorities act immediately, the genocide of the Kawahivas will be fulfilled shortly. Often, small tribes such as the Kawahivas are seen as an obstacle to the advance of oil drilling and agro-industry, mineral extractive industries, roads and dams. The Brazilian Amazon is home to around 100 isolated tribes, which make up the vast majority of the world's uncontacted population. They are the most vulnerable people on our planet. As the jungle is invaded and destroyed in the name of economic progress and personal gain, these peoples are attacked and liquidated by the simple fact that greedy outsiders know that they can even kill with impunity and the public media do nothing to report these horrors. These are silent and invisible genocides, of which there are hardly any witnesses. Often, the news only comes to light months or years later. 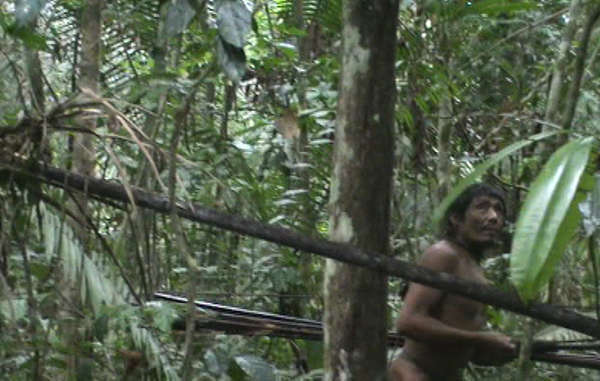 It is probable that we will never get to know the real number of uncontacted indigenous peoples that have been eliminated because they are indigenous, they may not even speak more than their own native language, not Portuguese, and they are seen by the established colonials and especially by the elite and government as a "nuisance" and obstacle to development. This mentality goes back to the Far West of the 18th and 19th centuries, when the native peoples of the United States were annihilated by the settlers, many of whom considered that "the only good Indian is the dead Indian". Jair Bolsonaro, president-elect of Brazil, also thinks this. He has declared that "it is a shame that the Brazilian cavalry was not as effective as the Americans, who exterminated their Indians." His words of hatred add fuel to an already incendiary situation: in recent months those who want to appropriate indigenous lands have been encouraged and attacks on indigenous communities have proliferated. Bolsonaro has proposed to take FUNAI, the Department of Indigenous Affairs responsible for uncontacted indigenous peoples, from the Ministry of Justice to place it in the new Ministry of Women, Family and Human Rights. This will undoubtedly reduce the effectiveness and influence of FUNAI. Moreover, she has appointed Damares Alves as the new minister, an evangelical preacher and parliamentary assistant. Along with other people, she founded Atini, a group dedicated to evangelizing indigenous communities that is being investigated by the prosecution for incitement to racial hatred against indigenous peoples. 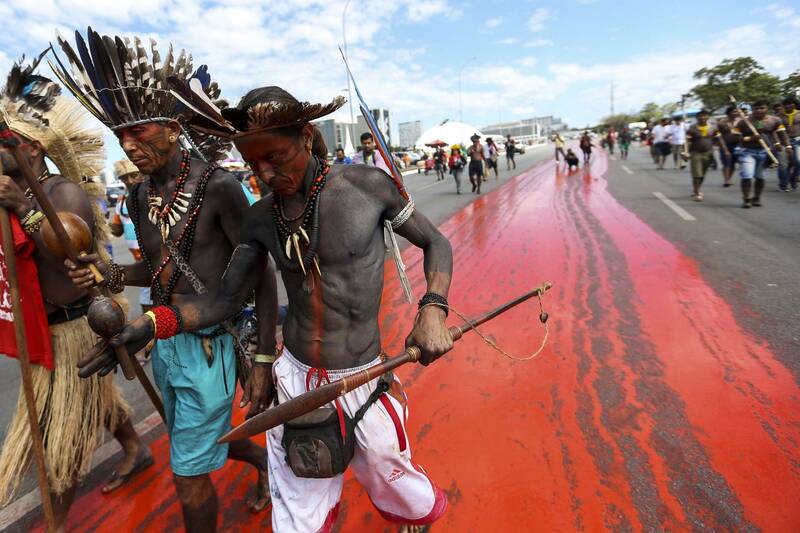 Bolsonaro has promised that under his presidency will not protect "a millimeter" more of indigenous lands. Sonia Guajajara, an indigenous woman who joined the candidacy of another candidate for the presidency in 2018, declared during the campaign: "In Brazil, there is a political decision not to demarcate territories and, when it is denied [the demarcation] an entire population is condemned to extermination". Things do not have to be this way. Survival International was founded 50 years ago, after the publication of the article "Genocide" by Norman Lewis, in the Sunday Times [British newspaper] in 1969, which revealed the atrocities suffered by many indigenous peoples in Brazil in the last century. 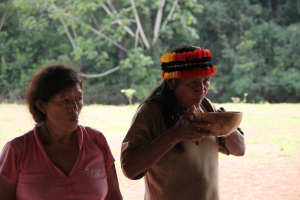 The 50 years of our successful campaigns demonstrate the strength and influence of raising awareness and mobilizing public opinion against governments and companies that do not respect the rights of indigenous peoples. Now more than ever we have to mobilize our collective strength to denounce and put an end to these hidden genocides. If we stand silent and do nothing we are also complicit in the annihilation of the indigenous natives who are the most responsible and environmentally conscious guardians of the Amazon forest. Story published in Spanish here. 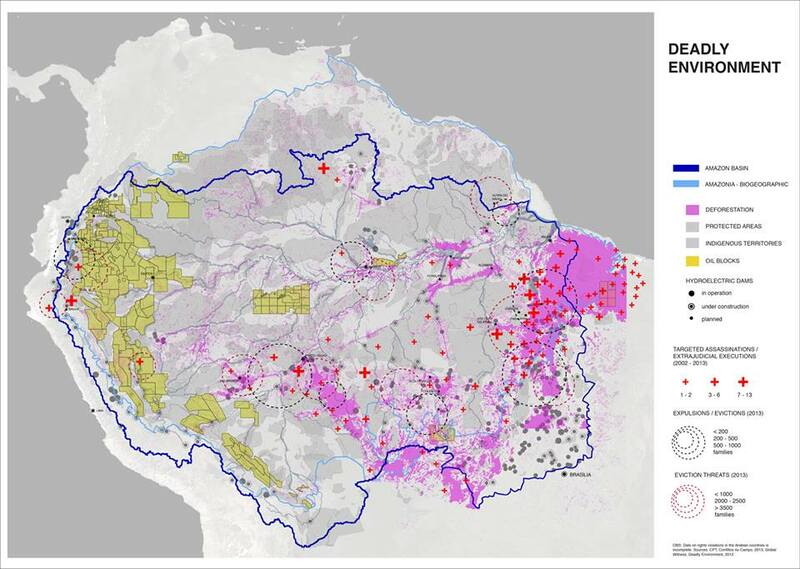 The above map shows the amount of industrial activity in the Amazon and the red crosses show the amount of indigenous people assassinated due to conflicts over rainforest that they are fighting to protect. Between August 2017 and July 2018 some 7,900 square kilometres of forest were logged in the Brazilian Amazon, the worst annual rate of deforestation in a decade, according to official government data. This represents an increase of 13.7% over the same period last year. Greenpeace Brazil pointed out, approximately 1,185 million trees were felled in an area equivalent to the size of 987,500 football fields. This worrying news comes amid fears that the new far right president of Brazil, Jair Bolsonaro, may worsen the situation due to his promise to open more the Amazon to the development of the timber industry, in addition to his public hatred of indigenous people, specifically the Kawahivas people who are on the edge of extinction. 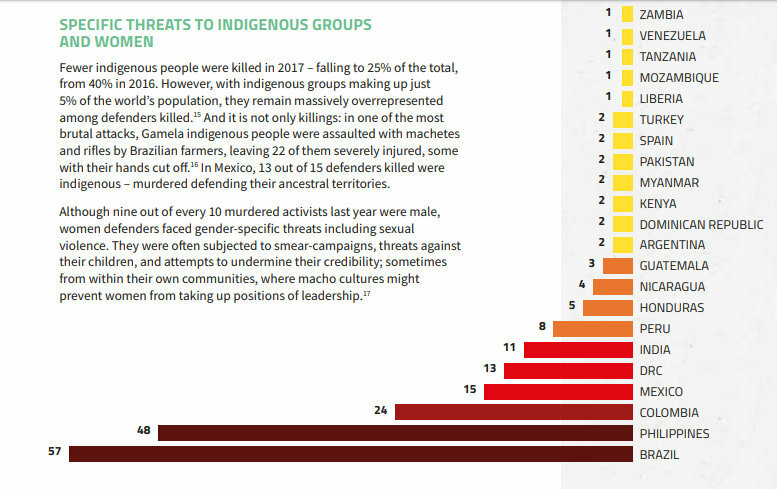 The above graph from Global Witness report ''At What Cost'' shows Brazil has the highest rate of environmental defenders being killed than any other country in the world. The Amazon rain forest is deadlier than ever for land and environmental defenders, with mining and oil industries and agribusiness, these industries are the most linked to genocides of environmentalists and indigenous rainforest activists. 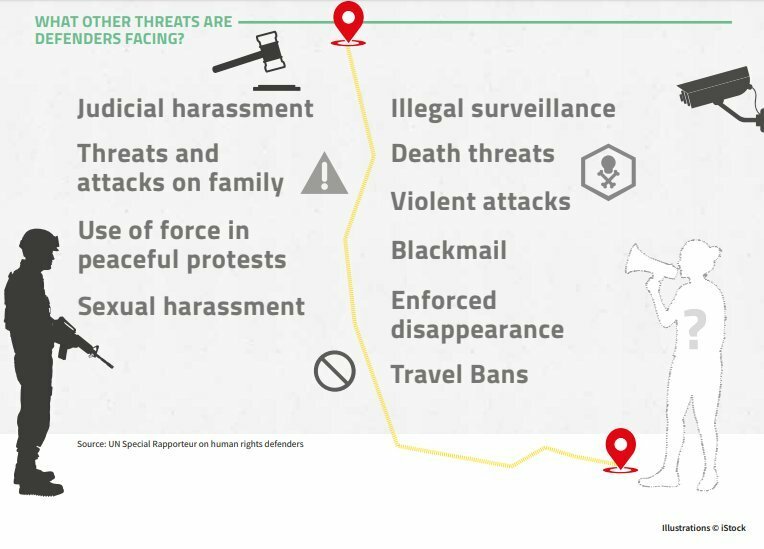 Global Witness's latest annual data into violence against land and environmental defenders shows a rise in the number of women and men killed over the last few years to 207 in Brazil especially. What’s more, Global Witness's research has highlighted agribusiness including coffee, palm oil and banana plantations as the industry most associated with these attacks. Between 2005 and 2011 deforestation decreased in Brazil by an encouraging 70%, mainly due to the increase in government protection in response to a growing awareness to protect the rainforest. Even between 2011 and 2017, when Brazil entered a more chaotic political period, the decline in deforestation stopped, but did not reverse. Bolsonaro's leadership plans, unfortunately, will undo some of that progress. However, not only is the rate of deforestation increasing in Brazil, it is also accelerating in Ecuador and the Peruvian Amazon and many indigenous natives are not given legal prior consultation to enter their territories for oil drilling or logging, therefore it is often done brutally with the help of military force, illegally violating indigenous people's rights. The Amazon rainforest is a boundless region that spans across eight developing countries: Brazil, Bolivia, Peru, Ecuador, Colombia, Venezuela, Guyana, Suriname and French Guiana. Colombia has done more in the past years to step up to conserving large areas of rain forest, they set aside over 28.4 Million hectares of rain forest for conservation purposes. 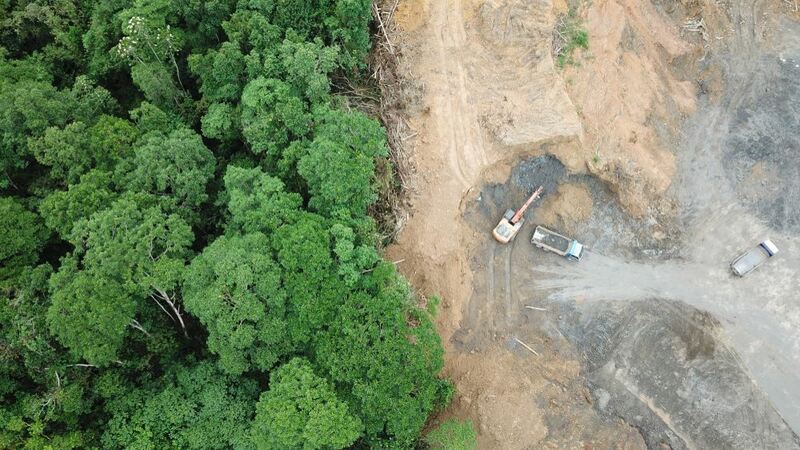 In a statement, Brazil's environment minister, Edson Duarte, blamed illegal logging for increased deforestation in the Amazon and called on the government to step up surveillance in the forests, Reuters reported. 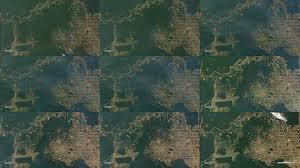 Greenpeace claims that the Brazilian government is not doing enough to stop deforestation. In addition, with Bolsonaro in command, "the predictions for the Amazon (and for the fight against climate change) are not good". The loss of forests creates an unpleasant feedback loop in climate change. Forests and forest soils are a major carbon sink, and deforestation adds more carbon dioxide to the atmosphere. In the new report of the Intergovernmental Panel on Climate Change, regarding the limitation of global warming to 1.5 ° C above pre-industrial levels, it is pointed out that the planting of more trees and the maintenance of existing trees are essential to achieve that goal. Moreover, in the Amazon, biodiversity loss is devastating and irreversible when deforestation occurs, it is not a matter of planting more trees. It is impossible to replace the biodiversity and species lost which have evolved through millions of years in the biodiversity rich Amazon. Half of the world's entire animal, amphibians, reptiles, birds, plants, and insect species are found in the Amazon rainforest which is the world's largest biodiversity hotspot. 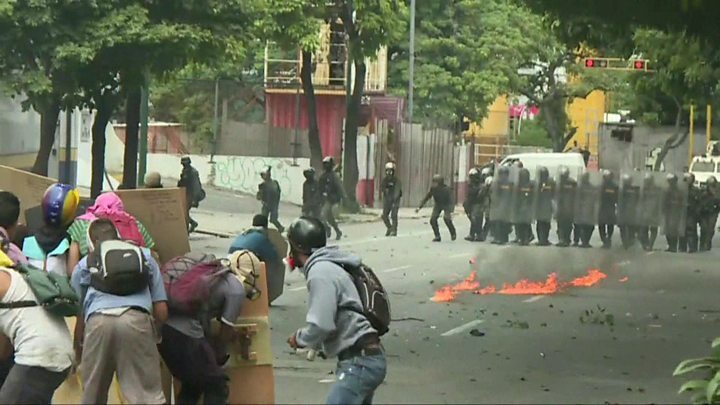 First this year, the US Sanctions were on Gold in Venezuela, amid the financial and humanitarian crisis, where Venezuelans have been forced to flee the country for years without international help or intervention after financial and governmental collapse. Now, the US is stepping in, starting with sanctions on gold and this week, US sanctions are on oil and finally, de-recognition of Maduro as president and Trump's coronation of Guaido as Venezuelan president - Al Capone redux . This is a geopolitical tactical move that will also affect China, Venezuela has for decades been the largest exporter of oil even though it's a small country in South America. One of the reasons the US has wanted to see its downfall in addition to co-opting its demise as with interfering with many Central and South American coops on a Machiavellian level, with the geopolitical strategies in place, US military base in Haiti, Mexican Gulf polluted and transformed into an industrial oil zone since the Mexican Gulf oil spill, US occupation of the oceans and Oil industry is present all the way down to Venezuela, possibly to hit China where it hurts cutting off China to Venezuelan Oil supplies will hit China very hard, as its biggest oil supplier has been Venezuela. US control of Venezuela is intrinsic in the elite power games between the West and the East. The US wants to make sure China doesn't overtake US power by 2025, which is predicted already by financial experts who say that China will become the global superpower if not soon at the latest by 2040 according to financial experts in Forbes, and the US will lose power since most of its finances has gone into military investments and it carries a huge debt in trillions. There are always years of geopolitical strategies involved in the crisis of any country, its not just by accident these things happen with planning and social engineering many decades and even a century in advance, hence predictive programming working so well.